Lindy Schroeder, mother of Ty Conn, a former student at Ottawa-Glandorf High School, spoke during Tuesday night’s Ottawa Glandorf School Board meeting about her concerns with the school’s attendance policy. 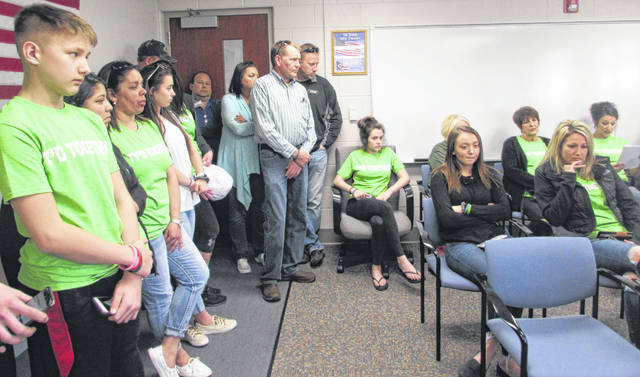 Friends and family of Ty Conn, a late Ottawa-Glandorf High School student, attended Tuesday night’s school board meeting. Ottawa-Glanforf School Board members heard from Lindy Schroeder, Ottawa, resident, about the school’s attendance policy. OTTAWA — Ottawa resident Lindy Schroeder whose son Ty Conn died Oct. 12, 2018, came before Ottawa-Glandorf School Board Tuesday night to address her concerns with the school’s attendance policy. 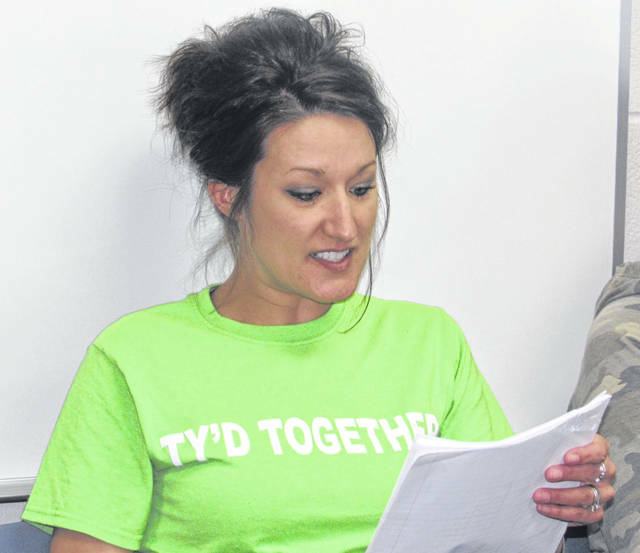 She and approximately 30 of her family members and friends attended the meeting and wore bright green shirts that said “Tyd Together” in honor of Conn. Attendees sat in the audience and many stood shoulder to shoulder. Conn’s death was ruled accidental from a gunshot wound. She is seeking attendance records to learn why he was allowed to email himself in absent from school when he should have been in class. She has been seeking answers to the school’s attendance policy ever since her son, who was a 17-year-old junior died in the woods near his residence. During Tuesday’s meeting she was allowed to address the school board for a 5-minute period prior to the board conducting its regular business. “I have a personal experience in which the school attendance policy was not appropriately applied,” Schroeder said. She said her son was absent from school for three consecutive days. A police report has previously stated his father was contacted about his absence. “Not once did the school contact me to inform me my child was not in attendance. The contact sheet was completed and submitted for the school year,” Schroeder said. She said all phone numbers were and still valid on the sheet and said she would ask that the school board determine if the current policy is being administered fairly and consistently across O-G schools. She was was notified by school officials after her son’s death that he himself had emailed school administrators that he would be absent from school Oct. 10 to 12. The school’s attendance policy states early dismissals must be called in to the principal by a parent, guardian or grandparent of the student. When a student misses class without notice or permission, the classroom teacher notifies the building principal for follow-up. Following her public discussion with the board she met in private with the board during a 30-minute executive session and then the board met in an executive session for another half hour. The board resumed its public meeting and there was no further discussion about the attendance policy issue. Don Horstman, superintendent, said all questions about the topic needed to be answered by the school’s attorney Jessica Philemond. “The school board met both publicly and privately with Lindy and will reach out to her directly for follow up,” Philemond said. In other business, the board approved a five-year administrative personnel contract for board treasurer Kathy Fruchey effective the 2020-21 school year. Also approved was Audrey Beining continuing to serve as principal at Ottawa Elementary and Sara Ballou to serve as O-G High School’s choir director to replace Ted Ellerbrock, who is retiring.